One of the reasons for visiting Islay in February is to catch up with the many raptors that winter on the island. 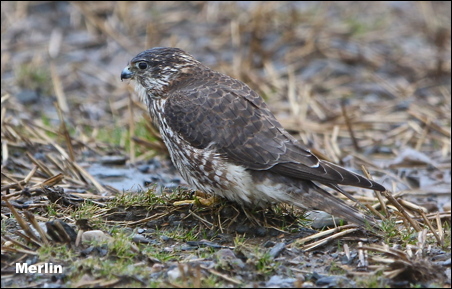 As only one pair of Merlin breed on Islay in summer the winter sightings are of Icelandic birds that have come south in October with Redwings and like the Redwings they always seem darker plumaged than our British Merlin. This weeks photo is of a female stood in a stubble field looking for potential prey. I was lucky as she was near the road and I was able to take several photos from the car before she was on her way. Moments like that don’t come along too often and if your camera is not out ready you will still be waiting for the next one!! I will include more photos of Islays wildlife in next weeks gallery as they certainly warrant a closer look.